According to a report provided by Counterpoint Research, India’s overall mobile phone shipments grew 37 percent and smartphone shipments grew 12 percent with feature phones growing an astonishing 55 percent during 4Q 2017. Reliance Jio Phone scaled a new high in the fourth quarter on 2017, emerging as the market leader in the feature phone segment with 27 percent, followed by Samsung at 14 percent, a new report said from Counterpoint’s Market Monitor service. One of the key reasons for the sale of this phone was record pre-orders (6 million) plus many feature phone users found it a worthy upgrade, Tarun Pathak, Associate Director at Counterpoint, said. 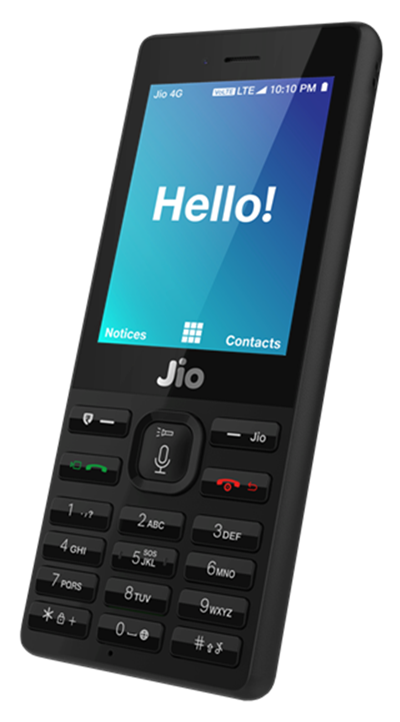 The company announced the JioPhone is almost cost-free (after factoring in the rupees 1500 refund after three years) and Reliance Jio’s rupees 153 plan offers customers with 1GB data per day, unlimited voice calls and access to Jio apps. Now Reliance Jio’s rupees 49 plan offers with 1GB data, Validity 28 days unlimited voice calls and 50 SMS only for JioPhone. According to news report sources, Jio carries more than 100 crore GB data per month.